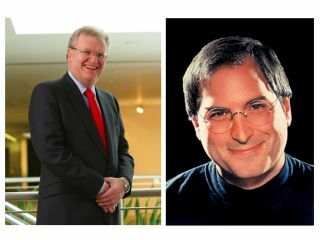 Sony CEO Sir Howard Stringer has accused Apple boss Steve Jobs of being "greedy" at a conference in the USA. Stringer hit out at Jobs who himself had accused record companies of greed in 2005. Stringer said it was funny that Jobs had accused record companies of greed when the Apple boss is the one who wants a world where only he makes money. Stringer made the claim at an Allen & Company meeting in Sun Valley, Idaho, which Barry Diller ( IAC ), Jeff Bezos ( Amazon ) and Sergey Brin ( Google ) also attended. "Anderson, you're missing something here, Howard Stringer just called Steve Jobs greedy." Stringer then apparently backtracked from his outburst. Stringer's frustration with Steve Jobs is understandable. The Apple iPod and iTunes Store duopoly are now so powerful that record companies have become increasingly unhappy about their ability to negotiate fair deals (in their view) with Apple. Universal Music Group decided earlier this month not to renew a long-term contract with the store. Stringer's outburst could be a sign that Apple and Sony are embroiled in tough negotiations over Sony BMG 's music catalogue, as well as on content from Sony's movie business. Jobs accused record companies of being greedy at the Apple Expo in Paris in September 2005 when it emerged that some wanted to charge much higher prices for new releases on the iTunes Store. Apple is said to earn little profit from iTunes, it's the record companies who get bulk of the money - Apple prefers to makes money on iPod hardware instead.